Doubtless there are many of you who were (or still are) impacted by the massive super-dericho storm that slammed across the eastern United States this past week. I am traveling through DC at the moment (jealous? ), and last night we had some kind of storm. You can see the tree down. Cable (not that I care about TV, but internet and phone) was down, power in some areas and traffic signals were out for about 3/4's of the day. We are due to get another storm tonight, so the panic begins. 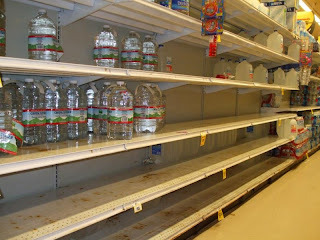 ...empty shelves for water, etc. But my favorite is the other Exxon gas station (and you can read the sign for Washington in the distance) is the one that I like the best. Why? Because that particular gas station is out of gas, and you will never guess who the neighbor is behind the chain link fence . . . wait for it . . . The Dept. of Energy. May be it is just my twisted sense of humor, but I thought that you would find that interesting too. Wilson's observations were echoed and confirmed by endless news articles over the past week. And of course if you're one of the millions impacted by this storm, you know what he's talking about first-hand. If there's a silver lining to the massive disruption, impact, and tragedy this storm jas wreaked, it's that the need for preparedness was underscored and illustrated in graphic terms. There are various articles (such as here) which highlight this. Today is Wednesday, July 4, 2012. I am writing from a small town in central West Virginia and I would like to share some thoughts, observations, and lessons from the recent Derecho windstorm experienced by the mid-west and east of our great country. As I sit here, we are in day six of total power outage caused by a freak storm that came with little or no warning. Power may not be on for another four days. · Gasoline was gone within 24 hours. Lines were just like the 1970s fuel embargo. · Ice became the chief commodity and was in short supply or no supply. 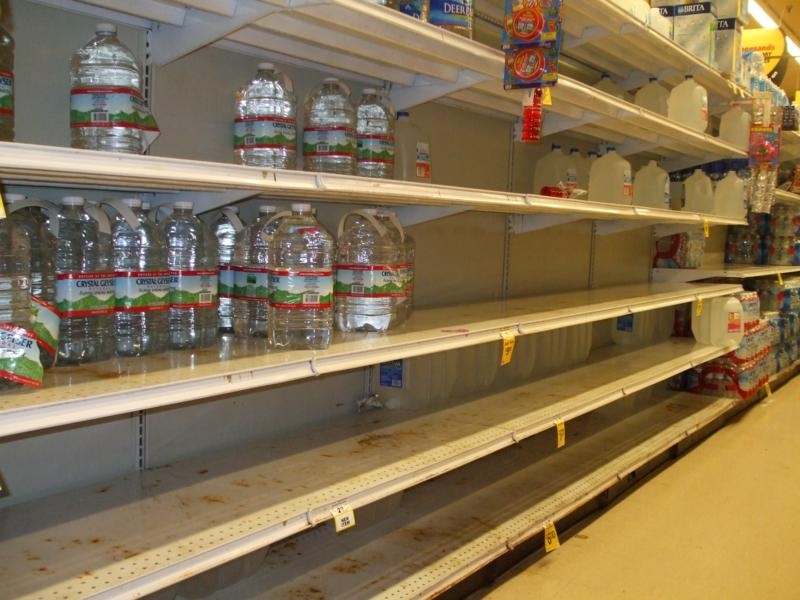 · Water was out for most people at least for the first two days. 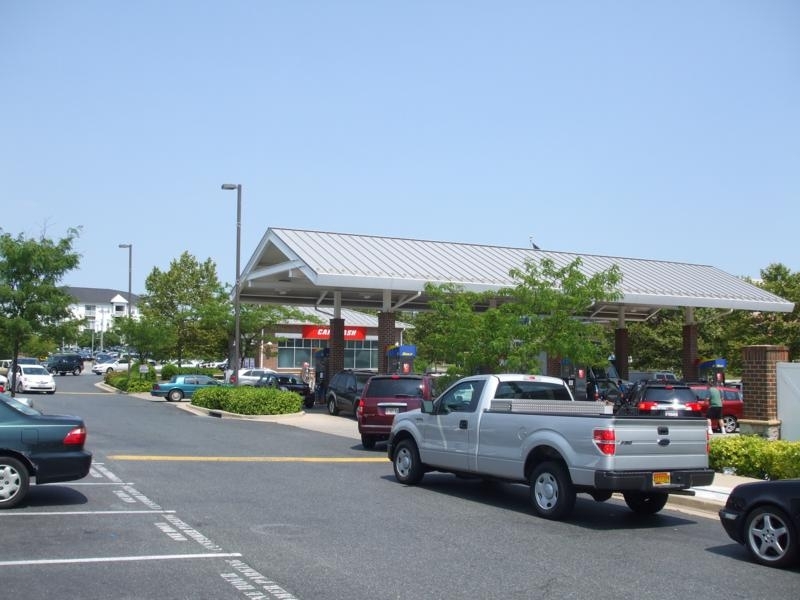 · Most big box stores and gas stations were up on generator power by day three. · A new shipment of 250 generators was sold in a few hours. · Temperatures in the high 90s added another layer of difficulty. Most people kept their cool and neighbors helped each other. Many are much better neighbors now. With all traffic lights out it was hectic but for the most part people were safe and courteous. We used to have a tourism commercial about West Virginia that showed four cars pulling up simultaneously to a four way stop and each driver motioning for the other to go first. The tag line was “Traffic jam, West Virginia style”. I am happy to say that was true in most cases. · I needed good high quality kerosene lanterns with reflectors and extra wicks. The cheap Chinese red ones at Wal-Mart are toys. · I needed a good tough portable radio with multiple charging sources. I was reduced to listening to a car radio and risking battery and gas. · A couple of deep cycle marine batteries would have been nice. · A generator and fuel reserve have moved from the nice-to-have list to the have-to-have list. The local radio station stepped up to the plate and suspended normal programming and went live 24 hours on generator with news and call-ins giving information. The unpreparedness of some of the call-ins was instructive. On the second day several were screaming for FEMA to arrive. Well, in our recent primary election, Democratic voters supported a prison inmate in Texas with over 40% of the vote, so I do not expect FEMA anytime soon. It is obvious to me now that there will be a die-off in any major disaster. Those on medical oxygen or diabetic will not survive. There is also an element of just plain stupid out there. One lady drove 30 miles to a neighboring town to get water for her children when simply listening to the radio would have directed her to a fire station two blocks from her house. Mr. Rawles, I know your feelings about areas anywhere east of the Mississippi but I must say that, in general, West Virginia enjoys some advantages as a retreat. Property prices and taxes are low, low population density, low crime rate, no urban problems, minimal gun laws, and a conservative and religious population. For the most part, it is “Almost Heaven”. I have turned a corner on preparedness and I hope my neighbors have too. Bottom line: We must have three days of supplies at a minimum and build from there. Thanks for your blog. We lost power for only a couple of days, but we had a generator and gas on hand. Thing is, gas only lasts so long and then....we need a way to water our cattle and other livestock. That seemed to be the biggest hole in our preparedness. More matches, more propane, more canned meat. Have to wonder what "Wavetalker in West Virginia" was preparing for, considering a storm that caused a power outage caught him so completely off guard. Supervolcano eruptions, space aliens, or zombies maybe. Like the last item in his list too, a generator. So if the power goes out, it might be good to have... power? Seems so obvious in hindsight, but who would have thought of it beforehand? ;) Water, a radio, lighting, fuel - his list of 'holes' is all Preparedness 101 stuff. Not to be too harsh on him, but wow. Just wow. Well, in fairness, I think what we have here is someone who "just got mugged". By his own admission, "I have turned a corner on preparedness..." At least now he's thinking out loud, and has identified holes in his routine. You about to get a freepalanche, honeychile! Scary, "Wavetalker of West Virginia" considers himself a prepper but yet he states he needs at least 3 days of supplies at minimum. I would at least shoot for 30 days to start. I've ordered from them! Great little company and A1 customer service! I live in northern Virginia and I experienced the Derecho. It was the strongest, most violent wind I've experienced. I lost power for 19 hours and can say I had no difficulties, of course, 19 hours is nothing even in 100 degree heat. I do have a very small list of prep tweaks to address but nothing major. More than 1 million people lost power in the Washington DC metro area. What I find most fascinating is the damage and destruction in Maryland and DC (I live in the great Commonwealth of VA). 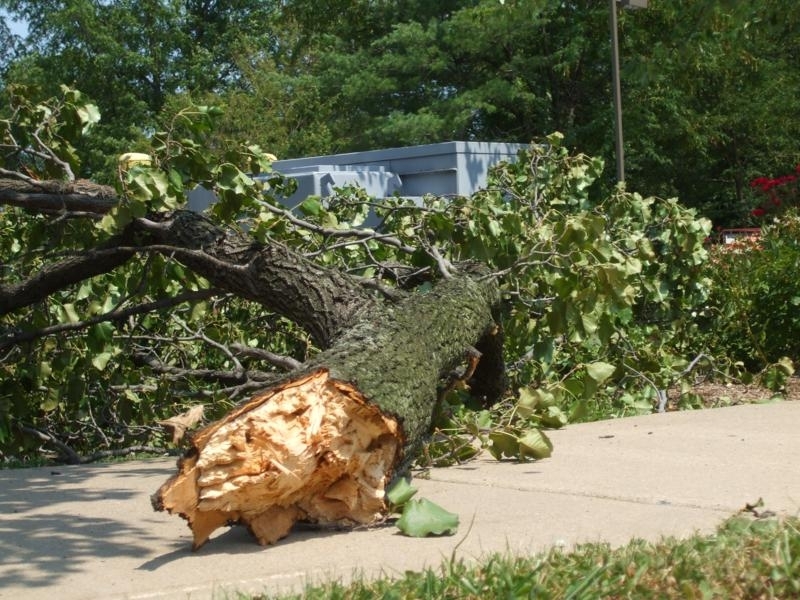 MD and DC restrict the tree trimming the power companies can perform and then complain when they lose power. 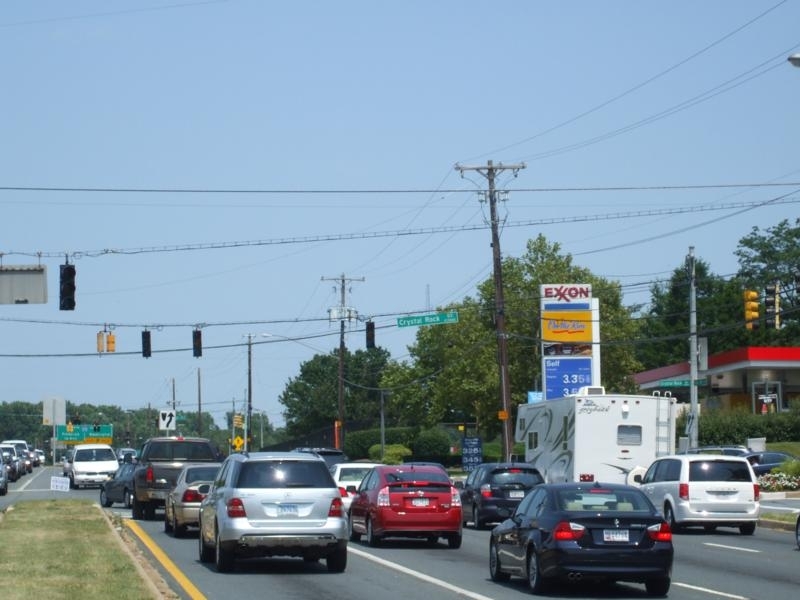 On the radio today one of the local news stories mentioned that they had planned to further restrict tree trimming in one of the heavily affected areas (Montgomery Co, MD). It really is just laughable as though there is no relationship between trees taking power lines down and tree trimming. Even in this situation with a ravaged power grid and people waiting for power days after the event, the power companies and tree trimming companies have restrictions as to the trimming they can legally perform. So the Governor of MD and the Mayor of DC both publicly abused and blamed their power companies but here in VA our Governor (rightly) praised the progress of our power company. You could not ask for a more telling contrast between responsible conservative government here in VA and the spendaholic, blame-based Demorats in MD and DC. One other observation from this storm - my neighbors are not prepared, not even a little. that is as stupid does here in america, I lived thru Andrew and feds could not get it right fer 21 days, same as Katrina, get prepared many more uncomfies comming and soon be prepared. @Old Sarge. True, least he has a better handle on the problems now. I'd have thought him just new to the whole idea of having some self-reliance, everybody starts somewhere, except he says, "I have been a long time reader of your blog and have lots of lists and plans...". Sounds like a armchair prepper IMHO. All plans, no practice. His alias, "Wavetalker", made me wonder if he's a HAM too - with no way to power his set, or even an AM/FM radio outside of his vehicle, during the outage. If true how tragically ironic, almost to the point of being comedic (since no one got hurt). Test your preps folks, "No battle plan ever survives contact with the enemy.". We live in SE Ohio and just got our electric back yesterday, it went out last Friday. We were able to transport most of the freezer to our daugther's house but did lose some food. It did show where we are weak, lighting was a big problem. Even in the day, we need more lights, just the way the house is, it is dark enough to need a light. It was frustrating trying to find what we needed and keeping things safe was hard. Also we have been putting off developing a spring for a second water supply. It was a good spring but last year when it waa dry it dried up. I have stored water to flush and wash with but we needed more. We lost some trees but the house was spared. Most of the family left for vacation, the ones left worked and ate out. The heat is something I couldn't cope with. I guess I would have to. Our daughter was married on the 30th. We made due and will always remember this storm. We made it through just fine in a larger city in N. Indiana...our house was built in 1890, so it was just an opportunity to kick it old-school. With thick brick walls and large windows, we had air coming through and plenty of light during the day. Fortunately our power was just out for a day and a half, but some people still don't have power today. And we didn't have to face the brunt of the extreme heat. The kids were a little scared, but we had fun giving them baths by candle light (I highly recommend the tall Catholic devotional candles in the glass holders; pretty darn cheap, they last a long time, and the kids enjoyed the pictures of Mary and Jesus) while listening the music and news on a hand-cranked emergency radio. The first night, we didn't feel like cooking, although we had several different methods to cook (grill/camp stove/dutch oven/open flame) and all kinds of food, so we took a fairly extensive tour around our side of the city and finally found a McDonalds' that was open. The kids had fun playing on the playground, but I didn't make them finish their chicken nuggets because my 6-year-old said, "Mom, they make me feel like I'm going to vomit." Good girl. The place was swamped, with all kinds of sheeple lining up at the drive through, so it made for interesting observations. The next morning we had breakfast at our usual Saturday morning diner. The next morning, our koi were gasping for air with their heads out of the pond, so we set up a hose to spray in a small jet of water to help aerate, and that solved the problem. I did throw our some food from our fridges that I couldn't fit in 2 lareg coolers, but really, they needed to be cleaned anyway, and our chest freezer is a battle axe, so all my meats didn't even get a slick on them. One question: is it even remotely possible to pressure can meats on a grill burner or a camping stove? We had relatives' freezers as backup if we needed to move the frozen meats, but plan C would be to cook and can the meats. If anyone has experience with this, I would appreciate hearing about it, including how much fuel it took to a) cook the meats and b) pressure can them for 1 1/2 hour. We do have on our list to get a generator down the road. We were fine without it, but I wouldn't ever want to lose that freezer full of expensive organic, free-range meats. Additionally, I will be buying another cooler or two (just in case) and making sure we have plenty of frozen ice packs in our fridge freezers--we have a lot of ice in the chest freezer, but I didn't want to open it at all. Any thing you can cook and pressure can in your kitchen you can cook and pressure can on an outdoor gas burner or on a wood fueled “rocket” stove or on your Weber kettle. I know because I have done it on all these in the last couple of months. HOWEVER, there are some safety precautions you must take. Some gas burners deliver lots more heat than your kitchen stove. You could put in so much heat that you pop the safety valve on the cooker and spew out hot stuff all over the place. It is a helluva mess and can scald people. Until you get some practice with your gas burner you will need to keep an eye on gas valve settings (flame height) constantly during the cooking process. The same thing applies to wood fueled fires. Fuel your fire with small chunks of wood that will burn out fast and need frequent replenishment. Further, you need to shield the sides of the cooker from flame. Don’t let the flames lick up the sides of the cooker. This can scorch and destroy the rubber gasket between the canner body and lid or damage the canner’s handles. I made a heat shield for the cooker from a piece of sheet metal. I cut a hole in it about the size of the bottom of the cooker. This metal sets on top of the stove. The cooker is set over the hole. Fuel is fed in from the sides of the stove/kettle. The metal is large enough to shield the canner handles. "Mr. Rawles, I know your feelings about areas anywhere east of the Mississippi but I must say that, in general, West Virginia enjoys some advantages as a retreat. Property prices and taxes are low, low population density, low crime rate, no urban problems, minimal gun laws, and a conservative and religious population. For the most part, it is “Almost Heaven”." I am from central WV too and this storm helped me see the faults in my own preperations. The most alarming thing was the panic that developed almost immediately. Many people have no clue and are super dependent on someone else to take care of things for them. Imagine if that was two EMP bombs exploded in the higher altitudes one over the west coast and one over the east coast knocking out 80 percent of the US Grid forcing the grid to be restarted from scratch! Hint. We don't have enough supplies to fix every circuit board in America fried. I am also from central WV and we weren't prepared by our lack of stored fuel. We had less than 10 gallons but had just filled my van so we has over 40 gallons there. My husband works at the local gas station and we let them use our generator (theirs wasn't enough to run the gas pumps) and someone loaned us a smaller one with which we struggled for 4 days to keep our fridge and freezers going. We were able to get gas even when he quit selling to others because of this but it could have been so much worse. Other than that we were fine. We just got internet back and still don't have phone.I learned much from this including the fact that I want to become MUCH less dependent on those freezers! Time to can more of the meat we process even if it takes more time. There are still many in our area without phone or power. Prayers being said for them. It seems William Sonoma, the kitchen store with the hilarious snooty descriptions, is now equipping back-yard pseudo-preppers. You can buy over-priced chicken coops, custom made raised beds for your garden to impress your snooty friends with how agrarian you are. If the link doesn't work, search for Williams Sonoma Agrarian and get ready to LOL. As the anonymous commenter that questioned Wavetalker's preparedness efforts above, I would like to sincerely apologize to him here, and instead nominate Robert H. (JWR's site, "Non-Fiction About Fiction", July 7th article) for the coveted "Armchair Prepper / Fantasy Survivalist Roleplayer of the Year" award. JWR seems to be scraping the bottom of the barrel lately, but at least he's giving us the opportunity to meet some of our fellow 'preppers'. Test your plans folks, please. You need to find a way of hardening you're generator so it will run in the event of an EMP either natural from the sun or man made from a high altitude atomic bomb exploded something like 200 miles in space. You won't even know it happened unless you happen to be directly under it bird watching and see a brief flash with no sound but what you will notice is suddenly all machinery is silenced including automobiles. A good book of it is *One Second After* about a small town called Black Mountain North Carolina near Asheville experiencing it and a small Christian family that has some survival supplies has to deal with the after effects of the EMP and somebody in the town eventually gets their airplane started that's an old prop plane pre computerized and finds out gangs are on their way from the big cities and the area needs to defend itself.